It just doesn’t feel right. I’m sitting here Shiva Asar B’Tamauz morning. I’m at a job site at 7:30 in the morning waiting for workers to come while everyone else is in shul davening and saying selichos. They are all davening, I’m not. They are all fasting today, I’m not. It just feels wrong. I feel so alone. I feel as though the whole world is on one side doing what they are supposed to be doing and I’m alone on the other side. Hashem, can I invite You into my world for a few minutes. I’m sorry that it’s a bit dark in here. It’s usually this way, with an occasional ray of light from the sun stealing its way through the permanently closed window shades. 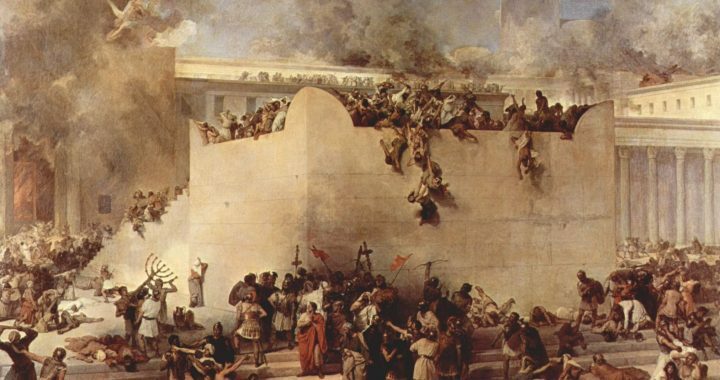 One of the things we mourn over is the fact that the walls of Yerushalayim were breached. The walls which protected us and gave us the sense of great security were broken into. Although we weren’t captured on this day, the mere fact that we lost that sense of security and confidence is a reason to mourn. Living life without the sense of security from protective walls is a tragedy. Hashem, I look at myself and my life and can’t help but compare myself to this tragedy. Every person is born with walls. With boundaries that are meant to protect them and give them a sense of security and safety. I too was given these walls. I had them for a short amount of time however as they were breached by my many, many years of emotional abuse. I was told things that children are not supposed to be told. I was taught from a very young age that the world is a dangerous and scary world. Growing up in a dysfunctional home doesn’t allow one to flourish and grow the way children are supposed to grow. I lived my childhood years without that sense of security which is so vital for childhood development. However, even with all the emotional abuse I still had some walls remaining. I still did have some sense of safety. That was all until my sexual abuse. Once that started, it completely knocked down all the boundaries and walls. I lost my safety. I lost my security. I was all open and vulnerable to the evil of the world, or rather to the evil of the devil of a man who knocked it down. If he would have stopped after he knocked my walls it would have been a tragedy in itself but sadly, he didn’t. Once I was all open he attacked me time and time again, with his abusive and nauseating behavior. All types of abuse, in all places and at all times of the day and night. For five years straight I was at his mercy and was just a tool in which he satisfied his sick, unhealthy desires. Another tragedy that we mourn over is the fact that the Tablets, The Luchos were broken and in later years, the Torah was burned. Again, I look at myself. Anyone who knows anything about sexual abuse knows that it shakes one to the very core, including their religion. It shakes their view of yiddeshkeit very very hard. I too had my yiddeshkeit burned and destroyed. Through a mixture my abuse and my many years of religious abuse that I went through, my outlook on yiddeshkeit and the Torah was severely damaged. How is it possible to see the beauty in it if it was all given to me with such heaviness and if I may say abusiveness. If I had to sleep in shul on Shabbos afternoon because I couldn’t sleep at home because too much sleep is bitul Torah how am I supposed to see the beauty in Torah? If I went to the Rabonim about the sexual abuse and nothing was done what does that do to my view of the ones that represent the Torah? So here I am mourning my own life, my walls were broken, my Torah was burned and destroyed and yes I’m very sad about it. If I wouldn’t be at a job site now I would be crying over it. It’s sad, its really sad that I wasn’t given the opportunity to grow and flourish as a child and teenager. Now in my thirties I need to relearn all the things that I missed out back then. I need to rebuild my walls. I need to reinstate my security. I need to learn that the world is a safe place. I need to learn that the Torah and Yiddeshkeit are pure and beautiful. I need to relearn so many things that come so naturally for others. So instead of going to shul this morning I davened at home because it’s too painful for me to go to shul. I then went to work feeling so alone. Alone in my journey of healing. Alone in doing what I need to do in order not to get flooded with triggers. To assuage my loneliness I’m asking you to come join me for just a bit. I want to show you the world that I live in. It’s not the same world as everyone else. Do you see all my battles and struggles? Do you not see my pain and confusion? I’m trying my very best to heal and sometimes in order to heal, one needs to let go of certain things just for the sake of healing. I need to let go of going to shul, saying selichos and fasting today. I can barely make it through the day with eating and there’s no way I will be able to make it through while fasting. All my inner turmoil takes up so much room and uses up so much energy that I need every bit of energy to simply get through the day. It’s not an easy journey. There are many ups and downs. There are days that I feel like I gained tremendously and all my hard work paid off, but then there are days that are so difficult. So full of triggers. So depressing and on those days I feel like I’ve gained nothing at all. Although I know logically that I gained and grew, on those dark days I am so emotionally drained that I feel like I’m back to where I started. I know and trust in You that you are not upset at me for davening at home, for not fasting today and for others things that I do or don’t do. I’m simply trying my best. I’m trying to heal from my past, be a Father and Husband and run a business. It’s all very draining and I don’t have an ounce of extra strength for the triggers from shul and davening. So instead of all that, I’m saying my own personal prayer to you. It’s in the form of this letter and it’s coming straight from the depths of my heart. Please accept my personal tefillah. Please be with me in my journey of healing. Please give me the strength to continue my way until I’m able to once again see the light of day, the beauty of Shabbos and not dread it, the truth of your Torah and so many other things in which I was damaged to the core. In closing, I ask you, I’m fighting a very lonely battle as well as so many other victims out there. Please visit me and all the other victims, please show us your love and compassion and show us that the little that we do is so valuable because it all comes with such pain. Guide us along the very bumpy road called healing and hold us so that we don’t fall off the cliffs all around us. When the climbing gets really steep and hard, Please, I beg You, pick us up and bring us to the next part of the mountain.